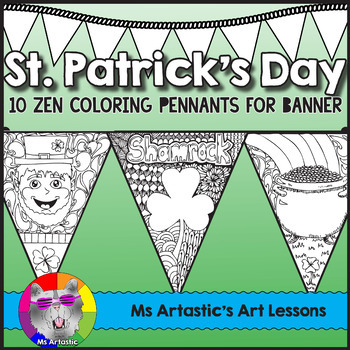 10 zen, coloring pennants to create a St. Patrick's Day's banner in your classroom! 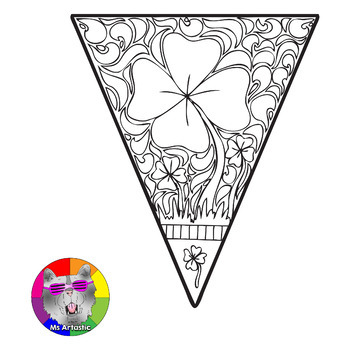 All coloring pages are hand drawn by Ms Artastic. 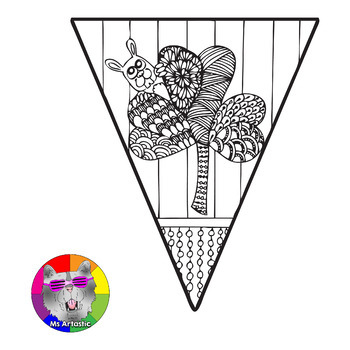 These intricate and detailed coloring pennants are great for providing a peaceful, quiet activity for your students and for use for decorating your classroom. They are all original drawings and are completely unique to Ms Artastic’s store and are not made up of clip art. 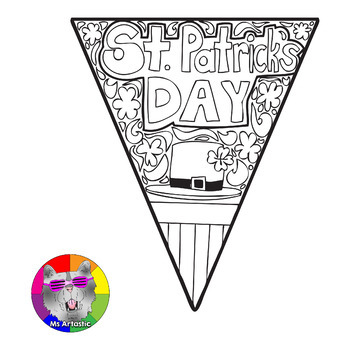 Let students (or yourself) create their own art pieces by coloring these pennants with any choice material including pencil crayon, crayon, felt, watercolor paint, chalk pastel, oil pastel or any medium you wish to use! -Perfect to use for decorating your classroom! Have students color them bold and bright! -Fold the top tab backwards and put over a string, rope or ribbon. Glue to the back of the pennant to seal the job and secure the pennant to the line! -String up in your classroom along a wall, chalk board, in a hallway, along the top of a bulletin board or across the ceiling!